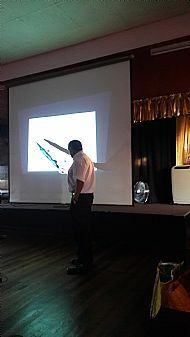 On Thursday August 30th 2018, at the Troon meeting of the Astronomers of the Future Club (http://www.actascio.org/aotfclub.asp), the speaker was Prof. Arjun Berera of Edinburgh University, explaining how he has updated the idea that life may be carried between worlds by meteorites, blasted off their surfaces by big impacts. He began with the classical dynamics of such events, mentioning the craters seen on Venus, the Earth, Mars and Europa, the ocean moon of Jupiter, and how they would eject material into space with the possibility that life could be exchanged between worlds. The basic idea goes back to Anaxagoras in 5 BC, and was given new impetus by the work of Svante Arrhenius, published in 1908. Big impacts are rare events, perhaps hundreds of thousands of years apart. At the other end of the scale the Solar Wind constantly flows outward from the Sun past the planets, but is too tenuous and imposes on the atmosphere too high up to be able to sweep up material. But space dust, ranging from microscopic particles up to 1 gram in mass, enters the atmosphere at 10 to 70 kilometres per second in quantities around 10,000 kilograms per day. It has been measured in space, collected by aircraft and balloons, and has a major rôle in precipitating rainfall. But much of it sweeps past on grazing paths, perhaps taking organic material with it. In his paper published in Astrobiology in 2017, Prof. Berera found that such dust could carry off material into space, as long as the dust particle was bigger than what it struck. Studying the effect of impact shock, heating due to air resistance, etc, it seems that micron-sized dust particles could remove not just gases and organic molecules, exchanging atmospheric constituents between planets, but even whole bacteria, perhaps several at a time. Terrestrial dust can be raised to at least 85 km by volcanic events, and by red and blue electrical jets above thunderstorms, while living bacteria have been found on the outside of the International Space Station. Dehydrated, they could survive for immense periods of time. The rate of removal could be as low as one particle per year, or as high as one per second. Either way, now that interstellar comets and asteroids have been detected passing through the Solar System, it’s possible that Earth life could have been spread throughout the Milky Way galaxy over the last billion years. Predictably, the talk provoked a lively discussion, which continued at McKay’s Bar after the vote of thanks. The next meeting of the Astronomers of the Future Club will be on Thursday September 27th, from 7.15 to 9 p.m. at the RSAS Barassie Works Club, 4 Shore Road, Troon, KA10 6AG. The speaker will be Eamonn Ansbro of the Kingsland Observatory in County Roscommon, Eire, talking about ‘Quantum Communication’, the possibility of faster-than-light communication with other civilisations.